A court appearance for Zimbabwe First Lady Grace Mugabe, relating to an alleged bloody attack against a model, is not yet on the table, said police spokesperson Vishnu Naidoo. "As long as we don't have a suspect in custody, we cannot say when they will appear in court." Police Minister Fikile Mbalula had earlier said that Mugabe had turned herself in to officers. "The minister learned later that it just didn't materialise as it was supposed to," Naidoo said. Grace Mugabe, 52, is under investigation after she allegedly used an extension cord to assault 20-year-old Gabriella Engels who was visiting Mugabe's two sons in a Johannesburg hotel on Sunday evening. The woman who opened an assault case against Grace Mugabe says she wants justice not only for her but for others who also claim to have been victims of the Zimbabwean first lady in the past. Gabriella Engels says that no level of intimidation will make her drop the assault case against Mugabe. Engels and two other friends were allegedly assaulted at a Sandton hotel on Sunday. The 20-year-old Engels says she's aware of Grace Mugabe's history of alleged abuse and wants her to face a court of law. In 2009, a photographer claimed he was punched repeatedly by Mugabe in Hong Kong. Engels says this can't be allowed. "I just hope that the fact that I'm being strong enough to speak against her and that means I can be the voice for other people who she assaulted." Engels says although she has not received any calls personally intimidating her to drop the charges, she fears leaving her house. Zimbabwe has requested diplomatic immunity for the first lady, Grace Mugabe, after she was accused of assaulting a model at a hotel in Johannesburg, according to a statement from South Africa's police ministry. "The suspect['s] lawyers and her government representatives made verbal representations ... that the suspect wished to invoke diplomatic immunity cover," it said. The statement also confirmed that Grace Mugabe - wife of the 93-year-old Zimbabwean president, Robert Mugabe - remains in South Africa, despite reports that she had returned home after failing to turn herself in to face charges of assault. The first lady is accused of attacking 20-year-old Gabriella Engels with an electrical extension cord after the model went to see the Mugabes' sons Robert and Chatunga at the Capital 20 West Hotel in Johannesburg's upmarket Sandton district on Sunday. Police said a 20-year-old woman had filed "a case of assault with intent to do grievous bodily harm". It was not immediately clear whether Grace Mugabe, 52, was travelling on a diplomatic passport or would qualify for diplomatic immunity if police do bring charges against her. Hinting at a potentially serious diplomatic rift between the neighbouring nations, the South African police statement said Harare had asked that Mugabe be granted diplomatic immunity. But it made clear she would be "processed through the legal system". The police ministry has confirmed that Zimbabwe's first lady Grace Mugabe has not left the country. 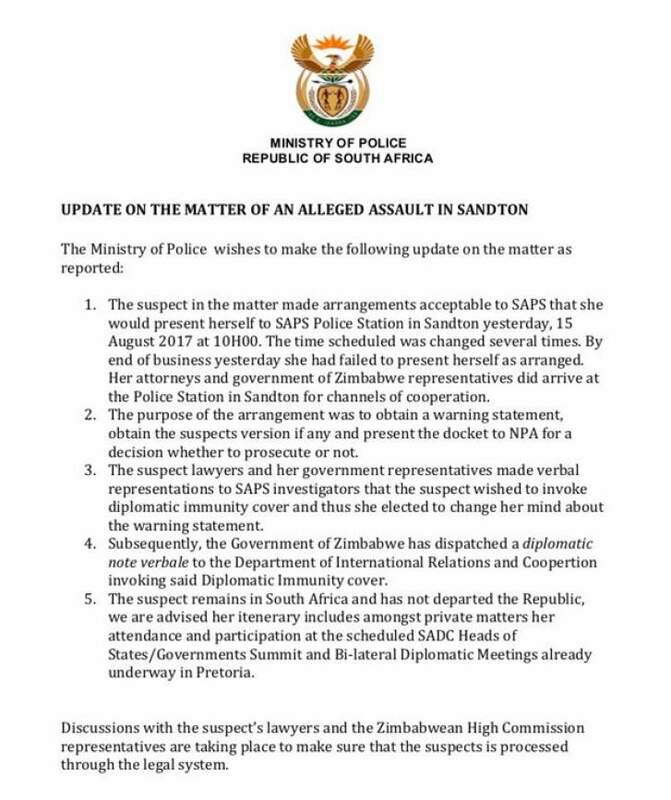 "The suspect lawyers and her government representatives made verbal representations to SAPS investigators that the suspect wished to invoke diplomatic immunity cover and thus she elected to change her mind about the warning statement," the ministry said in a statement. It said on Tuesday Mugabe had made arrangements that she would hand herself over to police at 10:00. She is expected to attend the SADC Heads of States/Governments Summit and Bi-lateral Diplomatic Meetings already underway in Pretoria. "Discussions with the suspect's lawyers and the Zimbabwean High Commission representatives are taking place to make sure that the suspects is processed through the legal system," the ministry said. 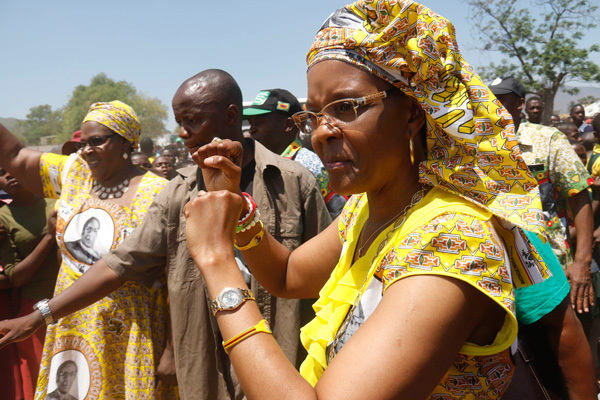 Reports have emerged today that Zimbabwean first lady Grace Mugabe is still in South Africa. South Africal news media indicated that the assault-accused wife of Zimbabwean necromancer-slash-president Robert Mugabe is somewhere in South Africa, The South African Police Service have also announced that they are ready to hand the docket to a public prosecutor. No arrest warrant appears to have been issued just yet. Zimbabwean authorities, meanwhile, have refused to indicate just where in the world the first lady is. EWN reports that 93-year-old Zimbabwean prsident, Robert Mugabe had to change his travelling plans to deal with the matter involving his wife. Local police said on Wednesday they knew the whereabouts of Zimbabwe's first lady Grace Mugabe, who faces accusations of assault, but declined to say if she had fled the country. The 52-year-old wife of President Robert Mugabe is accused of beating model Gabriella Engels, 20, on Sunday evening at the Johannesburg hotel where her two sons were staying. Engels said she suffered deep cuts to her forehead and the back of her head, and on Monday she registered a case with the police alleging assault with intent to do grievous bodily harm. "We know where the suspect is," South Africa's police spokesperson Vishnu Naidoo told AFP. "We are still continuing with the investigations. No warrant of arrest has been issued," he added after some reports suggested Grace Mugabe had hurriedly returned to Harare late on Tuesday. The alleged attack threatened to spark a diplomatic tiff between the two neighbouring countries, which have strong political and economic ties. Grace Mugabe allegedly arrived at the Capital 20 West Hotel with bodyguards and accused Engels of partying with her sons Robert and Chatunga, who are both in their 20s and live in Johannesburg. 'Kept beating me' Pictures on social media appeared to show Engels bleeding from her head after the alleged assault at the hotel in the upmarket business district of Sandton. Engels said she had been attacked with an electrical extension cord. "She flipped and just kept beating me with the plug. Over and over. I had no idea what was going on. I was surprised... I needed to crawl out of the room before I could run away," she told News24. Zimbabwe's president is expected to fly to South Africa later this week for a regional SADC summit which opens in Pretoria on Saturday. Grace Mugabe is 41 years younger than her 93-year-old husband and the couple has two sons and a daughter. Police Minister Mbalula told reporters on Tuesday that "in terms of foreign citizens, they must understand they have responsibilities, especially those who hold diplomatic passports. "We have had to act in the interests of the victim."